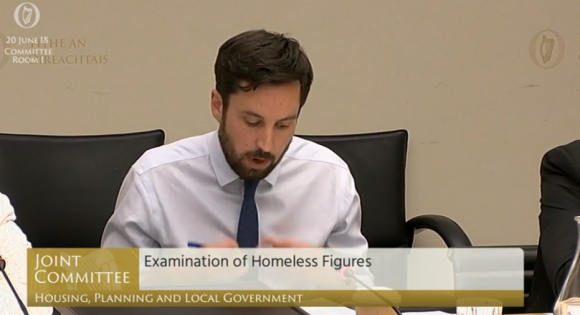 Last week I appeared before the Joint Oireachtas Committee to discuss the serious issue of homeless numbers. I also gave an update on two reports I published, prepared by the Dublin Region Homeless Executive and Inter-Agency Group on Homelessness. You can watch a video of the proceedings here. 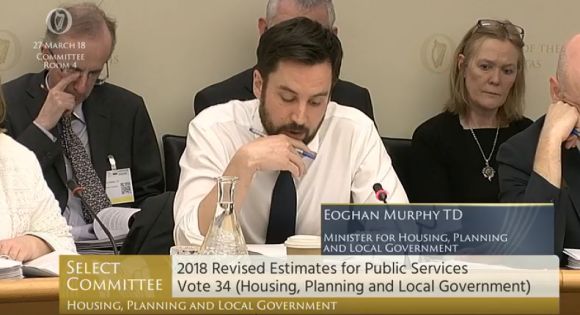 Last week I appeared before the Committee on Housing and Homelessness to give an update on the progress of Rebuilding Ireland. You can read my opening statement below. I thank the Chairman and members of the Committee for the opportunity to appear again before the Committee, this time to give you an update on the progress made in terms of the implementation of Rebuilding Ireland in the first Quarter of this year. To begin with our most pressing concern and in relation to homelessness, the first quarter of this year saw Storm Emma hit our country. Today, I would like to take the opportunity to once again acknowledge the efforts by all in local authorities, NGOs, emergency services and my own Department in keeping our rough sleepers safe and warm during that extreme weather event. Since Storm Emma, we have put an additional 60 emergency beds in place and we have seen significant progress with the number of rough sleepers on our streets reducing by more than 40% in April. To watch a video of the proceedings, go here. 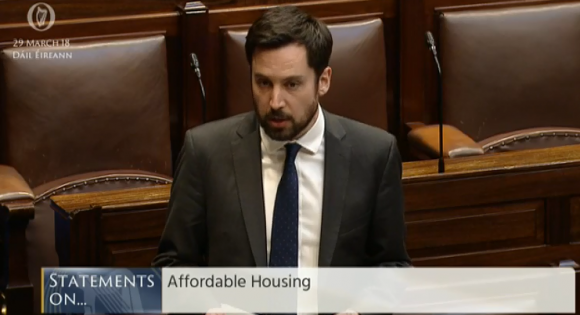 Last week in the Dáil I outlined our plans for more affordable housing. You can read my statement below. The years since Fine Gael assumed responsibility for the economy have been a success in economic terms. However, in terms of housing, we are now facing a great social cost and suffering arising from that success. These are compounded by the under-supply that preceded 2011. Surely the broken housing sector, which is now being fixed, is the long sting in the tail for a country that was so badly let down by the Fianna Fáil Party’s 13-year reign. 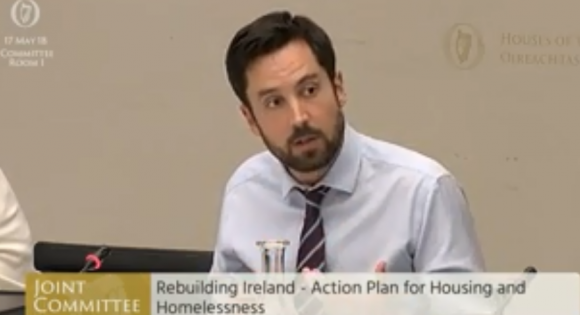 Our difficulties manifest themselves most severely and distressingly in the large number of homeless families in emergency accommodation tonight who are not mentioned in the motion…. When the Fianna Fáil Party states no affordable homes have been built since 2011, it is simply wrong. Our problem for much of the past seven years has not been affordability of homes but the reverse. We are now confronted with supply and affordability problems and the Government is fixing these as a priority. We launched a number of affordability measures last year. 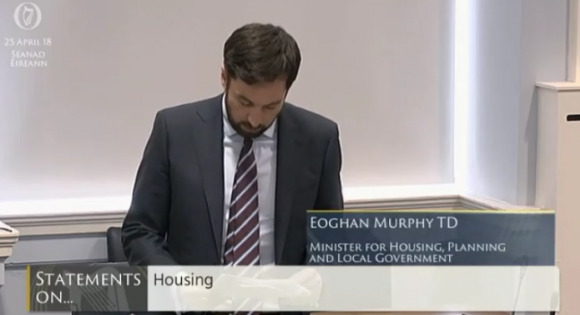 They include the local infrastructure housing activation fund, LIHAF, to which previous speakers referred, the introduction of a successful fast-track process and new apartment guidelines which will drive down costs and rent pressure zones, which Fianna Fáil supports and recognises are working – hence the legislation it introduced today. Earlier this year, I launched three new affordability measures. A number of successful applicants have been approved under the Rebuilding Ireland home loan, although drawdown has not yet taken place because a couple of months are needed to find a home and secure agreement on sale. The affordable purchase scheme, which was also mentioned, was launched in January and we will also introduce cost rental projects at scale thanks to our partners in the European Investment Bank. We will build on these measures with further details under Project Ireland 2040 and these will be announced very soon. 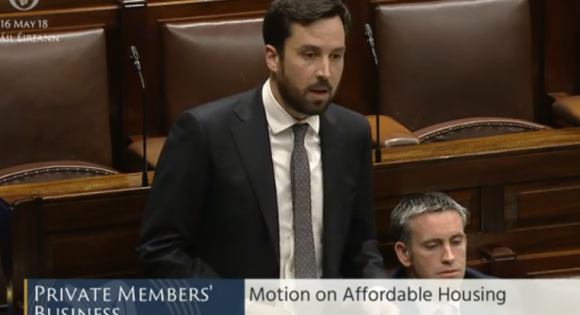 Today in the Dáil we spoke about affordable housing. You can read my comments below. At the outset, I wish to address the February homeless figures that I published yesterday. This latest report repeats what we saw in January and would seem to indicate a worrying trend since the beginning of the year in relation to the number of families presenting to our homeless services. However, I want to reassure the House that we are putting a huge amount of time and resources into helping people in homelessness, every single day and night of the week. -in January and February almost 300 families have been prevented from entering emergency accommodation or have exited it. -of the more than 100 families that presented in Dublin in February, only 20 were accommodated in hotels. During 2017, more than 2000 families left hotels into sustainable tenancies, the majority into homes. -last year more than 4,700 adults exited homelessness. So a huge amount is happening and it’s thanks to our partner organisations whom we fund through tax payers’ money – people like Peter McVerry Trust, Simon and Focus Ireland, working with our own teams. Yesterday in committee we talked about funding for my Department for the year. I outlined how much we would spend and what we would spend it on. You can read my opening statement below. I welcome the opportunity to discuss with the Committee today my Department’s Revised Estimate for 2018, as well as the Votes for the Valuation Office and the Property Registration Authority which, arising from a recent transfer of functions, are now also under the aegis of my Department. Turning first to Vote 34, the Revised Estimate before the Committee today sets out my Department’s budget for 2018. Gross expenditure of €3.264 billion is budgeted for my Department this year. This represents an increase of almost €1.2 billion or 55% on the provision in 2017. The gross provision for 2018 is made up of €1.633 billion in current spending and €1.631 billion on the capital side. In addition, my Department’s programmes will benefit in 2018 from resources of some €621 million that will be available from the Local Government Fund. You can watch a video of the proceedings here (part 1) and here (part 2). 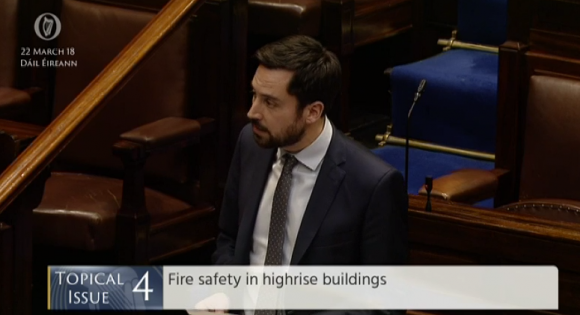 This week incredible bravery from our Fire Services saved lives when the Metro Hotel caught fire – I addressed this in the Dáil. You can read my comments below. A fire broke out in an apartment on the 13th floor of the Metro Hotel and apartment building in Ballymun at approximately 8 p.m. last night, Wednesday, 21 March 2018. The fire extensively damaged the 13th and 10th floors of the building. The building was evacuated successfully and there are no reports of missing persons or injuries at this point. Eleven units of Dublin Fire Brigade, comprising eight fire engines, two aerial appliances and the incident command unit, involving approximately 60 firefighters under the command of the chief fire officer, responded and assisted with evacuation, as well as fighting the fire. At this point, I am sure Deputies on all sides will join with me in expressing appreciation to the emergency services and all others involved in responding to the incident last night. They are incredibly brave in the work they do. I turn now to the fire safety task force. I established it in response to the Grenfell Tower tragedy of 14 June 2017 in recognition of fears expressed for fire safety in Ireland. On 27 June 2017, I tasked my Department’s National Directorate for Fire and Emergency Management with convening and co-ordinating a high level task force to lead Ireland’s reappraisal of fire safety. To watch a video of the exchange in the Dáil, go here. 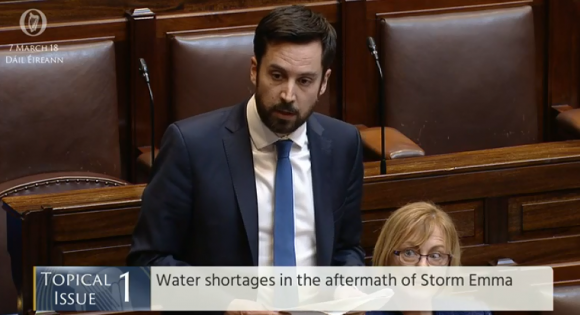 On Wednesday I took a Topical Issue on the issue of water supply leakages in the aftermath of Storm Emma. You can read my speech below. I acknowledge the inconvenience that disruptions to water supplies mean for customers and I thank them for their forbearance. 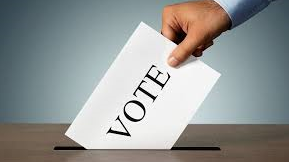 Every effort is being made to minimise the impact and to prioritise hospitals and daytime usage. I acknowledge the efforts of all the workers involved in Irish Water and local authorities and contractors, who are working so hard to restore supplies as quickly as possible. Over the course of the past few days, water outages related to power outages have been largely resolved due to co-ordinated work between Irish Water, ESB Networks and local authorities. Irish Water crews have been mobilised across Dublin and around the country to make the necessary repairs at plants and to fix bursts. Significant progress is being made. There are 30 repair crews on the ground finding and fixing leaks in the greater Dublin area. For example, in Dublin three major bursts, in the north docklands, Infirmary Road and Skerries, were wasting the equivalent of the daily water usage of Balbriggan, which has a population of about 25,000 people. These have now been repaired. To watch a video of the discussion, go here. 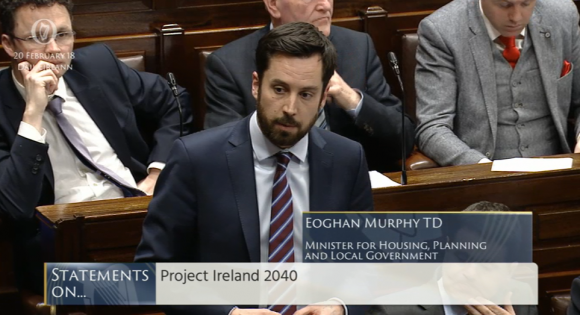 On Tuesday in the Dáil I spoke about Project Ireland 2040 which was launched last week. You can read my speech below. We face serious challenges today in Irish society. 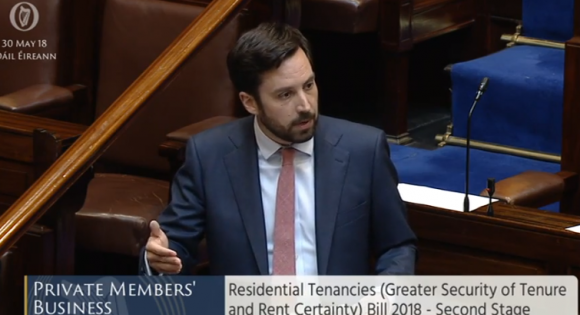 In my own Department, in particular, in housing, planning and local government, we have a challenge and a crisis in housing and homelessness and to face that challenge today, of course, we put in plans for the immediate term. Rebuilding Ireland is one such plan, for a five-year period, involving more than €6 billion worth of investment to deal with the crisis we have in homelessness and the challenge we face in the shortage of housing. When I came into my role as Minister in this Department, I said that if we did not plan for the longer term, in facing these immediate challenges we risked building in crises and problems into the future. We have a responsibility as a Government to plan long term, to take a long-term time horizon into the work that we do. However, it is also a great opportunity for us as a Government. Ten years on from when the banking crisis first began with the guarantee of the banks, with the national accounts balanced we can look to the future, and not only imagine a future Ireland for our people, but implement it. That, in essence, is what Project Ireland 2040 is all about. To continue reading my speech, go here.